Which Man Is Telling the Truth? Read the full articles here, here and here. She was in her mid-forties and moved into PAH shortly after receiving a diagnosis of breast cancer. During the one year she lived here, she grew progressively worse until she needed special care and had to leave. She died shortly afterwards off-site. He was in his 60’s and had heart issues. He was found unconscious in his apartment. He died shortly afterwards off-site. She was in her 60’s when she moved in. She had osteoporosis that progressed to such a point she experienced continual excruciating pain and loss of full mobility. She died in her apartment. He was in his 60’s and had diabetes which progressed to the point where he became wheel chair bound. Eventually he had one leg then the other leg amputated. He died in the apartment. She was in her 20’s when she moved here and was healthy. She was diagnosed with breast cancer shortly after the birth of her child around 2011. She died at age 33 and left a 2 ½ year old son. She died in her apartment. She is in her 50’s, first lived on the first floor close to the room that contains the three-story building’s bank of 48 “Smart Meters” for about two years. She then moved to the second floor unit closest to the cell tower. She suffers from severe migraines and vertigo. She is in her 80’s, developed heart issues after living five years in the third floor unit closest to the cell tower. She has electrical problems with her heart, just had her third surgical ablation and was recently in the ICU after coding. She is in her 70’s, lives on the second floor and is experiencing headaches, dizziness, fatigue, memory fog, inability to sleep through the night and bone/cartilage problems. She in her 40’s, lives on the first floor and has developed breast cancer since living there. She is in her 70’s and lives on the second floor and has horrible sleep problems, cartilage/bone issues and experiences memory loss. She is in her 30’s and her family first lived in another building for two years and then moved to her present location, which is in direct line with the cell tower. She has been experiencing severe stomach disorder that was first diagnosed as cancer, has a lump near her breast – which is being monitored, has sleep issues, headaches and extreme fatigue. Her 8-year old has morning headaches and tinnitus. Her husband has headaches after 15 minutes and needs to leave their upstairs bedroom. She is in her 50’s and first lived on the second floor near the room that contains the three-story building’s bank of 48 “Smart Meters,” for about three years. Then she moved to the first floor closer to the cell tower. Since living here, she has developed a condition that has rendered her thyroid to no longer function. She is the mother of Resident 8. She is now in her 20’s, moved into the second-floor unit with her mother at age 15 and lived there for four years. While at that apartment she had a cyst removed from her ovary at age 16. Also, while living there, she became pregnant and gave birth to her son. Her son coded three times after his birth and has had three surgeries for breathing issues. In 2013, she moved to another building. In February 2018, she had ovarian cancer surgery which removed a 15-pound tumor from her ovary at age 25. Her son, now mid-teens, has developed bouts of dizziness, severe headaches, fatigue, stomach aches and anxiety since living here. She is in her early 60’s and has been diagnosed with breast cancer since living here. She is experiencing on-going episodes of vertigo, migraines and tinnitus. Her daughter, now in her 20’s, has been experiencing headaches and fatigue. She is in her 50’s and has had two skin cancer surgeries. Her daughter, now early teens, has been diagnosed with Hashimoto’s disease. The woman told us the cell tower was built about 15 years ago and has been upgraded several times since then. She is in her 70’s, has Alzheimer’s and is losing her sight. Her husband, also in his 70’s has severe dementia. Sources: Nov-2018-Petaluma-Ave-Homes-RF-EMR-Exposure-Assessment and GigaHertz Solutions instructional video. 457x higher than FCC RF-EMR Exposure Guideline of 10,000,000 µW/m². More detail here. 1.3x higher than FCC RF-EMR Exposure Guideline of 10,000,000 µW/m². More detail here. I am asking you today to consider your family and their future lives — and the lives of all Americans — when you recognize that in 2018, the safety, privacy and property value hazards created by a peak RF Microwave Radiation measurement at ground level at 300 feet from a 4G Macro tower in Sebastopol, CA is very similar to the hazards from a peak RF-EMR measurement at ground Level at 100 feet from a so-called 4G “Small Cell” Wireless Telecommunications Facility (WTF) in Santa Rosa, CA: see post | photo 1 | photo 2 | video. I hope that when you fully consider the consequences — deaths and illnesses, detailed in [C], below — and the property value casualties caused by so-called “Small Cells” that force residents to be exposed 24/7 to pulsed, data-modulated, Radio-frequency Electromagnetic Microwave Radiation (RF-EMR), you will reconsider your vote tomorrow on WT-Dockets 17-79 and 17-84. No alleged “Race” or “Streamlining” is worth creating deaths and illnesses of Americans, the very people that you are supposed to serve. To prevent these deaths and illnesses, the FCC could, instead, allow local communities to integrate broadband technology as they see fit — which, in many cases would be Fiber Optic to Homes (FTTH) — broadband technology for which Americans already paid, but never received — with just enough wireless for calls and texts. Wireless video transmission is the energy-inefficient and hazardous choice. Wired video transmission (by fiber, coaxial or copper) is far superior: faster, more secure, more reliable, more energy-efficient (it is pulsed by light) and has no consumer hazards from RF microwave radiation exposures. The levels of RF-EMR exposures that create these deaths and illnesses detailed in [C] are far below the FCC’s scientifically-unsound RF microwave radiation exposure guidelines (just 2% to 10% of the RF-EMR exposure guideline, in this case). In light of this evidence, it is clear that the Wireless Industry and the FCC cannot lie to Americans’ biology; our body’s cells are not influenced by carefully-worded spin, but by the continuous peaks of RF-EMR. The science through 2018 is conclusive. There are biological effects from RF microwave radiation exposures at levels that are many thousands of times lower than the current RF-EMR exposure guidelines. The Wireless industry knows this. So do you, which makes your 2018 statement to Senator Lankford — “We are confident that our [RF microwave radiation exposure] standards are ones that are healthy for consumers” — both misguided and intellectually dishonest. The FCC’s attempt to write regulations that will more fully preempt local authority over the siting of Wireless Telecommunications Facilities (WTFs) creates a conflict in our laws and is inconsistent with the 1996 Telecommunications Act, as explained by the National Association of Telecommunications Officers and Advisors (“NATOA”),the National League of Cities (“NLC”), the National Association of Counties (“NACo”), the United States Conference of Mayors (“USCM”) and the National Association of Regional Councils (“NARC”) in their 9/19/18 letter, attached. In California, our City Council members take an oath to uphold and defend the California Constitution, Article I, Section 1 which lists Californians’ inalienable rights. Will you please consider the following evidence (especially that detailed in [C]), as you make your final decisions about tomorrow’s vote? [B]. 2018: FCC Commissioner Jessica Rosenworcel Appreciates 4G and 5G RF Microwave Radiation Health Hazards? Here are five of 16 photos that I took and posted on the web yesterday regarding Crown Castle/AT&T Tower #856144. These photos show that this Macro Tower is so low to the ground, the four antennas directed to the Northwest are sending their beam of RF microwave radiation directly into the second and third story bedroom windows of 565 Petaluma Ave. Sebastopol CA where we have discovered serious health problems, cancer and deaths affecting many residents ranging in age from 14 to 80 years old. Yesterday, I measured peak RF microwave radiation exposures exceeding 1,000,000 µW/m² from the bedroom windows of this apartment building. This problem exists because the base of the tower is 25+ feet lower than the parking lots of the hospital and apartment building. Everyone would benefit (including AT&T) if Crown Castle raised the tower another 100 feet to prevent the direct beam of the RF microwave radiation from impacting these bedrooms like this, sending the signal over the apartment building. I am certain that the City of Sebastopol would cooperate with building permits to correct this obvious problem. While we are considering that solution, would it be possible to turn off these four antennas that are facing Northwest (the ones pointed directly at the apartment building)? The residents would appreciate relief from these very high 24/7 RF microwave radiation exposures. > Up to 10 µW/m² might be OK, (0.02 µW/m² is all that is needed for five bars on a cell phone). Beyond that, it is hazardous. I hope that Crown Castle and the City of Sebastopol will address this problem with urgency. This problem is also very relevant to the upcoming changes to Sebastopol Municipal Wireless Code and Zoning Ordinances. Attached for your review, please find the revised Petaluma Municipal Wireless code. 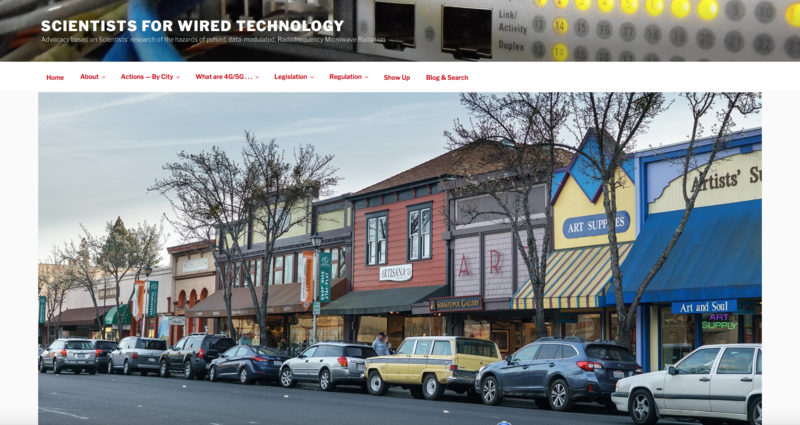 We are asking Petaluma to further revise its code to include RF microwave radiation maximum power output limits. It doesn’t really matter what one’s current definitions are for “large” or “small” Wireless Telecommunications Facilities (WTFs) or for “high” or “low” RF microwave radiation exposure levels. The only true Apples-to-Apples comparisons are the measurable power levels of RF microwave radiation exposures and the adverse health impacts caused by certain measurable power levels of RF microwave radiation exposures. The sad and devastating outcomes at the Petaluma Avenue Homes (http://scientists4wiredtech.com/sebastopol/#celltower) prove that the 1996 FCC RF microwave radiation exposure Guideline is not protective. In addition, the Sebastopol City Council members took oaths to uphold the California Constitution, quoted below. SECTION 1. All people are by nature free and independent and have inalienable rights. Among these are enjoying and defending life and liberty, acquiring, possessing, and protecting property, and pursuing and obtaining safety, happiness, and privacy. SECTION. 2. (a) Every person may freely speak, write and publish his or her sentiments on all subjects, being responsible for the abuse of this right. A law may not restrain or abridge liberty of speech or press. SECTION. 3. (a) The people have the right to instruct their representatives, petition government for redress of grievances, and assemble freely to consult for the common good.